After she viewed a Consumer Products Safety Commission (CPSC) advisory that showed just how badly her toilet could injure her, Marcia Jenkins of Sun City, Arizona, might as well have been living in a horror movie. 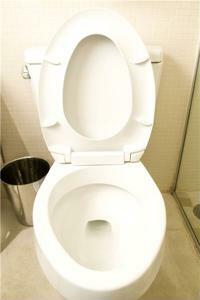 The agency's warning revealed that the next time she flushed her toilet, she could be maimed. This CPSC warning was due to a potentially malfunctioning high pressure water conservation device called the Flushmate III Pressure-Assist Flushing System installed in her john. According to the news source, the CPSC recalled more than 2 million Flushmate IIIs in June after it was reported that an excess of 300 of them had exploded. Flushmate thoughtfully contacted Jenkins and advised her against flushing. However, when she asked them what they would do to rectify the problem, they told her she would have to implement the repairs herself. "We are striving to exceed our customers' already high expectations of us and have voluntarily announced, in cooperation with the CPSC, an at-home recall repair kit," a representative from the company told the news program. The company went on to say it hopes everyone with a potentially explosive toilet uses the repair kit. However, after realizing that Jenkins had complained to the media, Flushmate hired a plumber to rectify her problem. Even though only 304 Flushmate IIIs exploded, the CPSC recalled well over 2 million units of the product, all manufactured between 1997 and 2008. That's not including the more than 9,000 units of the water conservation devices recalled in Canada. A statement from the agency notes that, when a faulty Flushmate goes Chernobyl, it may cause the toilet tank to bust, sending broken shards of porcelain flying and potentially causing cuts or other injuries. Anyone with a Flushmate III installed in their toilet should shut down the water flow, find another toilet to use and check to see if the product's serial number can be found in the recall.